Vijay Deverakonda's upcoming movie 'Dear Comrade' is going to get released on May 31st. The last schedule of the film recently took place at Athirapally falls in Kerala. On this note, some of the pictures of Vijay Deverakonda and the leading lady of the film, Rashmika Mandanna from the location are doing rounds on the internet. 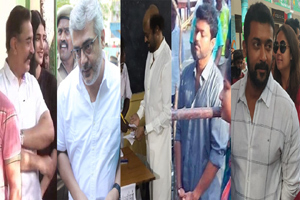 The pictures are from the shooting sets and some local Kerala girls also appeared in the pics. 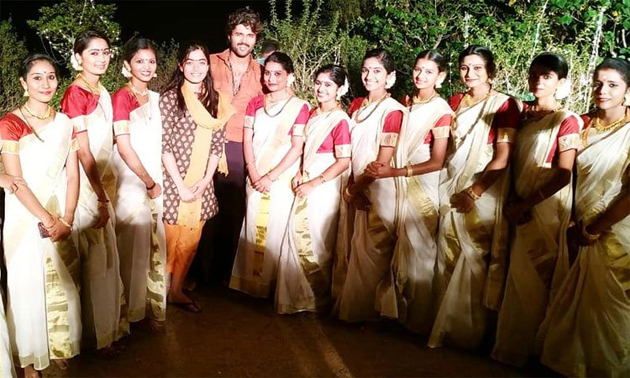 Interestingly, in one of the pics, Vijay and Rashmika posed to the camera with Kerala girls in traditional white sarees. It seems like the shooting took place in the dense forests of Kerala around Athirapally Falls. The movie is going to get released in four different languages Telugu, Tamil, Malayalam, and Kannada. The recently released teaser of the film has created a positive impact on the film. Though some of the netizens reacted negatively, the teaser has grabbed enough attention.